Been working on the suspension. Replaced struts, top mounts and strut bearings. After doing the fronts, I saw the drop links were shot and replaced them. This fixed clanking going over bumps, so decided to do the rears. The seller gave me a pair of new Porsche rear rotors and Ate parking brake pads, so I fitted those as well. After all that, the right rear rotor is rubbing lightly on the backing plate. Ended up removing the caliper and parking brake shoes. I swapped the rotor from the left rear for sanity check, same noise. I put one of the old rotors on, same noise! We used the alternate method of taking the wheel nuts off when installing the rear struts, but my buddy (retired Porsche mechanic) had sold his big torque wrench, so he estimated the torque (this guy knows what he's doing), and I'll mention that there was no scraping after that. I have not taken it for alignment yet, as I'll do that after r/r the stiffening plate after changing the trans fluid. Any wisdom? As always, I appreciate the forum members' advice. Are you referring to the dirt shield behind the rotor? So you're saying it fixed after torquing down the axle nut some more? 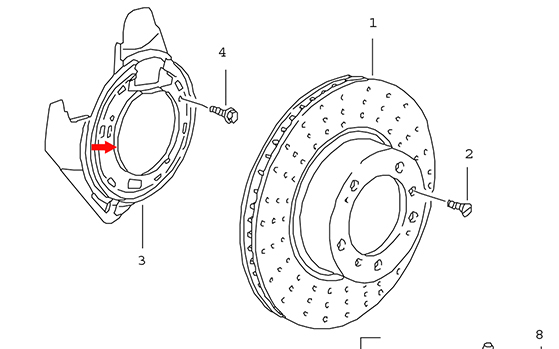 If so, that makes sense, if the wheel bearing isn't firmly clamped it can let the hub (and therefore rotor) wander and touch things that it would not if it did not have play. One of the warnings in the shop manual is not to roll the car if the axle nuts are not torqued to spec, because it can damage the wheel bearing, so that would be something to keep an eye on, if you did drive it any. I didn't use a torque wrench either, just used a long breaker bar parallel to the ground and stood on on it a certain distance from the end based on my weight, I don't have the formula handy but it is easily found. To be clear, my buddy and I used the same technique you did. I stood on the brakes and he torqued it with a long bar. I did not rub until I worked on the brakes. I have not yet had the torque verified, which I plan to do either with the alignment shop or my indy. Is it possible that the nut is too tight causing this? Have the same problem. When I did suspension rebuild I pulled on the dust shield helped a little bit but every now and then I still hear it. Gave up trying to fix it. Thanks guys. Saturday, coming home from errands I could hear it on the freeway fairly loud. Sunday is when I took it all apart and reassembled it. Yesterday, I went out and it is much quieter. Next time I get it up in the air, I'll check the shield again.